Lypo Gold’s high lipase (fat-digesting enzyme) content supports cardiovascular health, gallbladder function, and symptoms of lipase deficiency. When taken on an empty stomach or between meals, the lipase in Lypo Gold will assist the body to remove fats from the blood and help maintain support cardiovascular health. Taken with food, lipase will promote fat digestion, taking stress off of the gallbladder, liver, and pancreas. This allows for better fat metabolism with far less energy requirements. Gallbladder Distress: 1 capsule with each meal. Works best in combination with Digest Gold. Fat metabolism: 1 capsule with each meal plus 1 capsule 3 times daily on an empty stomach. Fat is essential for life. It is found in our cells, skin, blood (as HDL and LDL cholesterol,) and the sheath that surrounds our nerves. Fat also plays a crucial role in hormone production, and is a major source of fuel for the heart muscle. Although we generally get sufficient fat in our diet, we typically lack the healthy essential fats from fish and flax sources, and many individuals have problems metabolizing the fats they do consume. Lipase enzymes are lipolytic, meaning they break down or disengage fat. The body uses the enzyme lipase to break down fats in our digestive system and bloodstream. A lipase deficiency can contribute to an imbalance in your weight, hormones, or cholesterol, cause dry skin, gallbladder and liver distress, as well as vitamins A, D, E and K deficiency. Lypo Gold contains a high potency exclusive blend of lipase to support healthy fat digestion and metabolism. Recommended Usage: Cholesterol, cardiovascular, hormone support- 1 capsule 3 times daily on an empty stomach. I do not have a gall bladder, so when I eat fatty foods I feel bloated and have stomach problems. 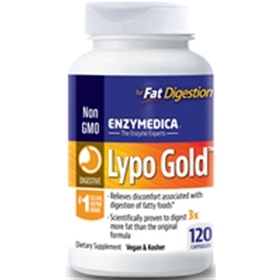 Taking Lypo gold along with digest gold has eliminated this distress for me, and I feel normal again-thanks Enzymedica.